Over the past couple of years, many home security cameras have taken their cues from the popular Dropcam, now Nest Cam. But none have done so quite as literally as Samsung’s SmartCam HD plus ($190). Despite the eerie resemblance, this new camera is no mere knockoff. Packed with features and customizable settings, it can be counted among the most impressive camera’s we’ve tested. The SmartCam HD Plus doesn’t stray far from the Nest Cam aesthetic. It comes in a plain black finish and swivels on a simple, detachable base. You can place it on a flat surface or mount it with two included screws and wall anchors. 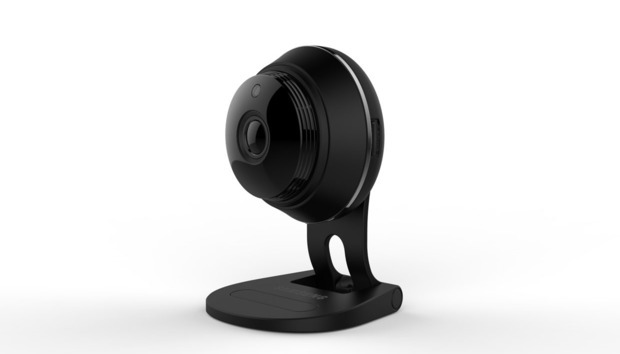 The camera mirrors Nest Cam’s specs as well, with a 130-degree field of view, 1080p full-HD video, night vision up to 32 feet, and an integrated mic and speaker for two-way talk. The last comes in handy when you want to communicate with kids or pets at home or startle and unsuspecting burglar. Samsung’s SmartCam HD Plus shares some design cues and key specs with Nest Cam. Like many cameras, The SmartCam HD Plus must be plugged into an outlet to operate and it doesn’t support battery backup. This is an important consideration when choosing a home security camera. If the power goes out or is cut by an industrious intruder and the camera can’t switch to battery power, it won’t be able to capture surveillance footage. As is de rigeur for the new breed of home security cameras, SmartCam HD Plus will push and email notifications to you when it detects sound or motion. False alerts are a common nuisance with this feature, so Samsung mitigates them with its Advanced Motion & Audio Detection. This is essentially a learning algorithm that can distinguish between incidental events, such as leaves rustling outside your window, and a body entering the room. The camera also lets you define detection areas to further reduce false alarms. The SmartCam HD Plus records up to 128GB of video locally to a microSD card (a 16GB card is included with the camera). Local storage cuts both ways. On the one hand, it eliminates cloud storage subscription fees, which can run a few hundred dollars per year. On the other, the absence of cloud storage eliminates a fail safe: Should an intruder steal or destroy your camera, or even just the microSD card, you'll have no forensic evidence of the break-in to give the police. For once, a security camera lives up to its “quick setup” promise. The SmartCam app succinctly guides you through the process of connecting the camera to your wireless network. It automagically recognizes your camera —no manually entering serial numbers or scanning troublesome QR codes—and I was looking at a panorama of my living room in about 5 minutes. Getting the camera to stay put on a flat surface proved more challenging. The power port is in front of the unit beneath the lens. This requires you to thread the USB power cable through the two prongs of its stand. The tension this created in the cable made it hard to set the camera straight and sometimes would even cause it to teeter over. This can be frustrating when you’re trying to get a particular viewing angle. There was no question the SmartCam HD Plus was ready for duty, though. Within moments of setting it up I was inundated with with motion and audio notifications. A quick adjusting of the sensitivity settings in the SmartCam app stemmed the tide. I also used the Motion Zone Select feature when I was away, so the camera could monitor the front door without picking up our dog’s motion. This involves drawing a square with your finger around a portion of the camera image. It gives you a little more flexibility in defining detection areas than the grid method used by some other cameras. Video was crisp and clear in both day and night mode and in all resolutions, though, not surprisingly, I got the most detail in 1080p. The medium resolution (720p) seemed to be the sweet spot that would give the best quality while not quickly eating up storage space. Video streaming was also clean and responsive with no pixelation. The SmartCam HD Plus can can be accessed through the SmartCam web portal or app. For convenience, I primarily used the the latter which, is loaded with features. In fact, it’s a bit overwhelming. Thanks to some odd icon choices, SmartCam app functions aren’t always intuitive. Each camera you add to the SmartCam app has its own menu that you access via an icon next to its name. This menu gives you quick access to the live feed, time-stamped activity logs and clips, and settings for everything from the camera to your network to the microSD card. When you open the live-streaming page, you’re presented with even more options on a horizontally scrolling toolbar across the bottom. From here you can record a 30-second video clip to your phone, take a screenshot of the feed, toggle resolution (low, medium, and high), and more. One unique feature is the ability to trigger the sound of an alarm, a police siren, or a dog barking. Presumably these are there to scare off an intruder you catch in the act, but I found the last also amused my dog when I was away. While the breadth of controls the app provides is impressive, the icons used to identify them don’t always make sense. The Resolution toggle is denoted by a checkerboard and beamed quarter-notes—which have become synonymous with iTunes—are used for the siren/alarm/dog-bark feature. Other icons—like Motion Zone Select’s, which resembles the walk signal at a pedestrian crossing—are just as baffling. A little experimenting got me oriented, but it’s a shame such a rich app isn’t more intuitive. The SmartCam HD Plus includes many of the same features of our favorite cameras such as Nest Cam and Simplicam, but without the added expense of a cloud subscription. That makes it particularly attractive if you’re on a budget or otherwise want to keep cost of ownership low. And if you can overlook some head-scratching app-design choices, you’ll likely be find everything you need in this home security camera and feel confident leaving your home under its watchful eye.